R.A.F. Air Diagram 2060, Sheet 2 of 3, July 1942. Lancaster I - Abandoning by Dinghy. Air Ministry, prepared by the Ministry of Production. Printed for H.M. Stationary Office by Flemings of Leicester. Approximately 100 x 68cm. Printed on thick paper this super poster is the second in a series of three giving advice to Bomber Command Lancaster crews on evacuating the aircraft in the event of ditching. 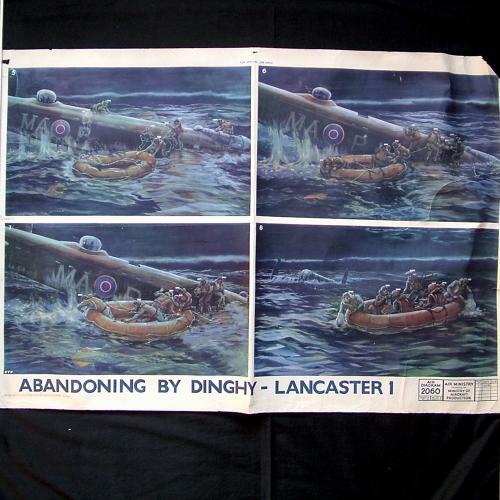 It shows four images of a Lancaster that has ditched in the sea and the progress of the crew as they leave their postions via the appropriate exit/hatch and make their way to the dinghy. The final image shows the crew using paddles to row the dinghy away from the sinking aircraft. It is interesting to note the aircrew are shown wearing 'flap-type' 1941 pattern Mae Wests and yellow skull caps over their flying headgear. A dinghy kite and radio can be also be indentified. Unfortunately condition is not great. Although recently stored rolled, the poster has been folded. There is substantial creasing and some paper loss at the corners, notably top right, less so top left and centre (see photographs 8 &11). In addition there are many small edge tears and some larger ones that are taped at the rear. The biggest of these is on the upper right image and runs across it for over 17cm with smaller tears branching off it (see photographs 5,6 & 7). This has been taped at the back but the edges of the tear are fairly evident. Careful colour blending with crayons would probably improve the appearance. Older repairs appear to have been made with some kind of 'duck' tape! Clear official markings and 1942 date. Despite the damage, this rare poster remains both dramatic and impressive. We also have Sheet 1 from the same series currently listed on the website. Stock code P20998.